I really wish I’d known about this silk and cashmere cardigan (my idea of heaven) when I was breastfeeding and travelling overseas a few years ago. It would have fulfilled all my needs: an impeccable and beautiful coverup during feeding time that could be worn in twelve different ways as a sophisticated cardigan afterwards. A big thanks goes out to Babyologist Jane, who has her own DKNY Cozy cardigan and has nothing but high praise for the sublime threads. The Cozy has been in DKNY’s collection every season since 2003 and has a dedicated cult following of fashionistas, with each season selling out fast. 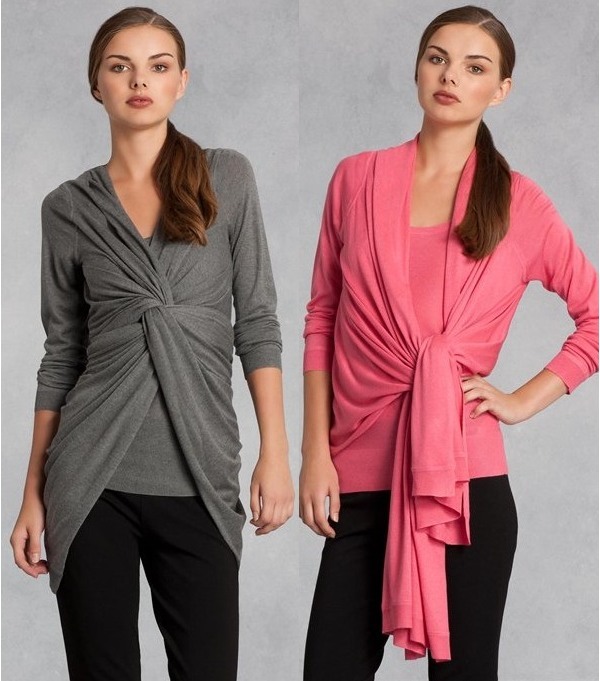 The cardigan is straightforward in its design: it has extra fabric in the front, with long sleeves and a straight, shorter back allowing the Cozy to be worn a multitude of ways. Perfection for new mothers who want a bit of coverage, breastfeeding mothers and, of course, any woman who craves a timeless and versatile wardrobe item (like me!). It comes in an array of delicious colours each season but black still remains the best seller. It’s available in a merino wool for cold winters, a linen for springtime and the most popular oh-so-soft silk and cashmere blend. DKNY is available from all major city centre Myer stores or head straight to DKNY to purchase for US$195. You’ll need a re-shipper to Australia as DKNY doesn’t post overseas.